I am an admitted California wine and food geek and the best thing I ever ate was fois gras on brioche toast, with a perfectly poached egg on top, all swimming in a rich, creamy sauce, paired with a white Rhône wine. It was at a restaurant called “Le Jardin” in Montpellier, France and it changed my perception of what food could be. Every bite was heaven. 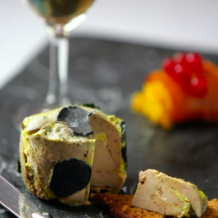 Foie Gras, especially when paired with the right wine, will rock your world! Luscious, creamy, savory and sinfully delicious, foie gras can be prepared in a variety of ways and is usually served in small portions, because it is so decadently rich. My writing career occasionally affords me some surprising luxuries – the reason I wrote this piece was that I was hired to write a couple of pieces by Pascal Brighi, who launched the Paris-based website www.foisgrasgourmet.com. He even sent me samples and I can’t wait to try them! Sabrina Silva, Certified Sommelier, Owner/Writer of www.gotchabythegrapes.com: “I’m a huge fan of bubbly with fat. So a grower vintage Blanc de Blanc for herb seasoned fat, Pinot Meunière bubbles for fruit component flavored to enhance the sweet while cleaning the palate with the perfect acidity…lastly a high quality cava for almost any flavor combination. This from the girl that always has a Blanc de Noir handy for my annual BLT shenanigans. I even had a couple of friends suggest pairing it with a good Cognac, Armagnac or even a rich Chimay beer. However you pair your foie gras, know that you are in for a true gastronomic treat! Joseph Jewell Wines – OMG!